It’s no wonder that Oklahoma U.S. Sen. Jim Inhofe has already endorsed Texas Gov. Rick Perry for president. Both men are anti-science Republicans who believe global warming is some type of vast conspiracy put together by world scientists so they can apparently have jobs and make lots of money. 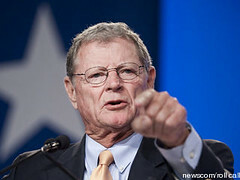 Inhofe, as you recall, once said global warming was “the greatest hoax ever perpetrated on the American people.” Inhofe has spent much of his senate career running a campaign against climate change science and shilling for big energy companies. This is what he is widely known for nationally. I think there are a substantial number of scientists who have manipulated data so that they will have dollars rolling into their projects. And I think we are seeing almost weekly, or even daily, scientists are coming forward and questioning the original idea that man-made global warming is what is causing the climate to change. Krugman’s overall point is that it’s “terrifying” that this country could someday be governed by a Republican Party that has become “aggressively anti-science.” That might come sooner than we think if the economy doesn’t improve. On Monday, Inhofe rolled out the typical clichés and anti-science rhetoric when he publicly endorsed Perry for president at the Tulsa Press Club. Inhofe said, “[Perry] won’t cave in to the extreme environmental activists or the Hollywood crowd and their liberal agenda.” Does this language still work on the GOP base? It seems almost retro at this point. The continuing attack on science by Inhofe and Perry is partially because much of the corporate media in both Texas and Oklahoma refuse to hold the politicians accountable for their remarks. Much of the media in both states present global warming and even the theory of evolution as political or social arguments and don’t focus on actual science. Essentially, the real social “argument’ is this: There are people who believe in science, and people who don’t believe in science. So who is right? In the end, Inhofe’s endorsement might actually hurt Perry more than it helps him because the Oklahoma senator is viewed as an extremist in other parts of the country. It also remains to be seen if Perry is mainstream enough to appeal to swing voters.